I was well in my thirties when it happened. ‘Oh my, look at you, you’ve lost a lot,’ she gushed. Inside, I bloomed like a Bougainvillea but pretended as if it wasn’t a big deal, ‘Thank you, but the weighing scale says otherwise.’ The inner joy however was short-lived. When the same lady greeted every second woman with ‘Hi, you’ve lost weight,’ I realized that the weighty compliment was her way of saying, ‘Hello, how are you.’ It meant nothing. Zilch. While I understand that flattery is an imperative social tool, the blatant chicanery of a social butterfly stung me like a bee. That is when I decided to be honest. Upfront. For almost a decade, I took pride in my candid observations of telling friends that they had gained or lost weight. Back then, honesty for me was this romantic notion, like agent of change Arvind Kejriwal and looming Achche Din. What would my friends do without an honest someone who said it ‘As It Was’? In black and in white. The chasm of credibility between what was stated, and what transpired, ensured that after every genuine weight related compliment, I was given a doubtful look, ‘Does she think I was fat earlier? Does she mean I look sick? Just because I didn’t wear any concealer today?’ Worse, every time I warned a friend that her tummy had begun to poke me while hugging, I lost a friend. However many genuine remarks I made, my friends drifted apart citing board exams of their kids, net addiction or plain social apathy. Over the years, some have forgiven me for calling them slim but those who were warned about excess calories, take it out by mixing extra vodka in my fruit juice. Research says that the best way to please a woman is to mention her weight loss. But complimenting women about weight can be complicated given that some are likely to misinterpret your compliment. They either feel they did not look good before, or, that you are checking them out, or, that they look sickly. So essentially, women want to talk about weight and yet, not talk about weight. What does it tell us? 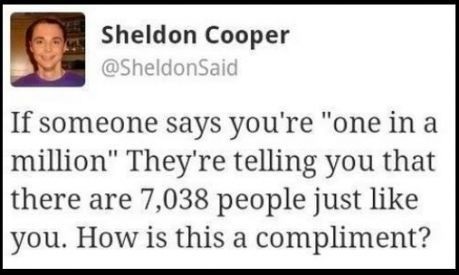 That women are like Sheldon Cooper? No. That women are insane? Yes. Oops, err no. No, no. It tells us that there is something about women and weight. It’s complicated. While my husband can still fit in his wedding shervani after more than two decades of marriage, I wasn’t able fit in my wedding trousseau six months after marriage. Therefore, it is not surprising that most small chats veer towards weighty issues like aerobics, gym, yoga and diets. It also tells us that weight has become an indicator of aesthetic appeal. Beauty. In my entire social history, there has been no instance when I was called fit. Maybe, I wasn’t. But movies and media do their bit to bracket us. If Sonakshi is fat, Sonam is flat. The choice is between being fat and being flat. So much for fitness. Decades of weighty social escapades coupled with moral mortification have taught me two things. First, do not, I repeat, do not comment on a woman’s numerical relationship with gravity. Just say, “You look lovely, fresh, ravishing, stunning. Anything. But refrain from weighty issues. Second, never say you look like your mum. I can’t really elaborate because my mum reads this. Just don’t, wokay? It is always a catch 22 where weight is concerned. So like you say, I refrain from alluding to anything in matters of heaviness. Really liked the post, Alka! Thank you Ilakshee. Having met you for a few minutes, I guess you are the candid types. So I really value your comment. You are hilarious, and I am being truly candid. 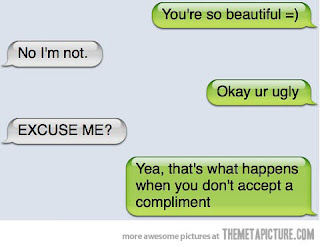 haha...I think most of the issues with the 'weighty' compliments is that we don't know how to react or how to take in the compliment without appearing immodest.. But I do agree with you that women shouldn't be compliment with anything related to weight! In fact, their husbands also shouldn't be! Somebody told S a month back that he looked like some actor Siddharth M but that he should try and loose some weight..So, while S took the compliment and even went only to joking that losing weight was no longer possible, I took offense and even went on to bicker that who is he to say that to my husband and who asked him his opinion on weight! So, you see you are right! True, taking the compliment is an art as much as giving is. Your anecdote underlined my post, ha ha. BTW, Sid M is really hot. Even with some extra pounds. Err, don't hit me. Thanks Afshan, always good to see you here. You haven't been writing much lately, have you? ya my frequency drastically dropped down :( trying to pick up ! It is best to steer clear of weighty issues--henceforward i am only going to use fresh,charming,lovely. I think giving compliments is an art and I really admire people who can flatter and please others with such ease. After losing some friends I have given up being honest. But sine I can't flatter most of the time I end up keeping mum and being labelled as anti social. Giving and taking compliments is an art. Makes sense to talk the weather rather than weight. :) I took four decades to hammer it in. honesty is seldom well received. we always say, tell the truth. no one wants to hear the truth. not even ourselves. it's always easy to accept the lie. but i dont see that as a lie. when im telling my friend she's looking good, when she's not; im not lying. im just being mindful of her feelings. if she is looking hideous and i say wow!! that's being spiteful. in such cases i wd say, this is good but u look far better in that other dress. i just sugar coat it. makes it more palatable. but that's me. but lovely write up as always. and issues that tickle our thoughts. It's an art to give and receive compliments. How about writing a post with some gyan for those who just can't get it. Haha. I have always been told that I look like my mum. I do not know how to take it (though I feel happy from inside :-D). Ha ha, yes I am happy too. Perhaps I don't like it because everyone says that. Was your tweet about friends comparing related to this article? You have a great memory Vishaal. No, the tweet was about a childhood friend. Always good to see you here. And yes, you never know how the other person takes it. Ha ha interesting, it is a careful line to take and careful line to cross, with compliments! Yep, you said it. Good to see you here Chatty. In fact, delighted. He he, Vishal. Et tu? Oh well, compliments are a bit dicey. I generally tend to lean towards an overall look. Weight is such a touchy issue for women that it is best to steer clear. I can't compliment if I don't mean it. I will just smile in that case. But, of course, I never get nasty. I think even a small compliment goes a long way in making someone's day. This was such an enjoyable post, Alka. Weight related compliments are dicey indeed. Thanks Rachna. Not in another fifty years. Yeah, first kid changes a lot for some women. Thanks for stopping by Asha. The tone, the tenor the look and the intent, everything matters. And yet you can be misunderstood. The fat want to become thin and thin want to become fat and people just keep adding fuel to the fire :) You are right. Just don't mention the weight. Enjoyed reading it Alka. Good to see you Jas. Ha ha, you are on the right track. Ha ha! That picture in the end, said it all. Compliments should be honest and genuine. No point otherwise. Great post.